Check out the information about ancient underground cities and settlements, and catacombs all over the world. Read about cities near Cappadocia and underground cemeteries in Lima, Palermo, Egypt and many other places. Tired of crowds of tourists? Bored by popular destinations and laid-back vacations? Want some extra adrenalin into your blood? In need of new experience? Then you’ve got into the right place! Browse through the information to get the expert ideas of how to make your holidays truly unforgettable and extraordinary. Keep off the beaten track with UnusualExperience.Com and see the world you have never seen before. The world beneath your feet harbors many mysteries, waiting for you to discover them. The incredible underground cities and settlements of Cappadocia, Turkey, will takeinto the ancient world, where people had to go under ground to save only their lives but souls. Or head to the underground cemeteries in Paris, Rome, Lima or Palermo and explore these amazing catacombs full of human bodies, bones and skulls. It is really unforgettable experience! 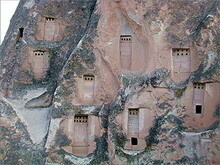 Here you may read about the underground cities in Cappadocia. Find out more about Derinkuyu, Kaymakli, Mazi, Ozkonak and Tatlarin. Consider information about catacombs all over the world. Check out what you can explore in the world’s famous underground burial galleries.